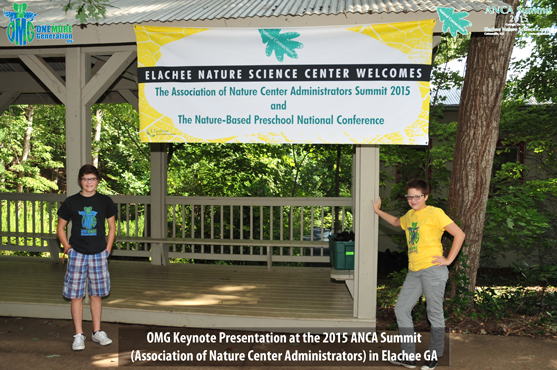 Recently Olivia and Carter were invited to deliver the keynote speech at the 26th Annual ANCA (Association of Nature Center Administrators) Summit in Elachee GA. 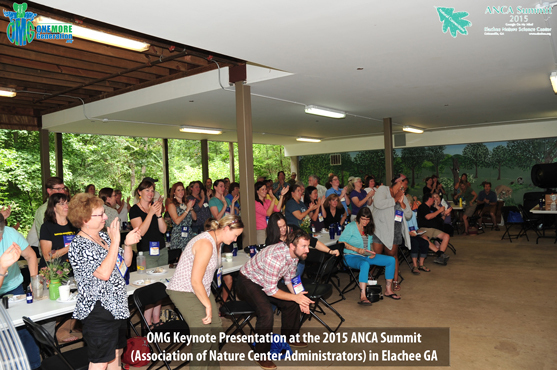 This years event combined both the ANCA and the Natural Start Alliance 2015 Nature-Based Preschool National Conference together for an exciting summit held at the Elachee Nature Center in north Georgia. 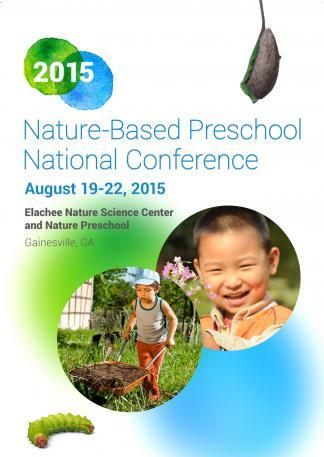 The Nature-Based Preschool National Conference brings professionals together from around the country to advance the movement to use nature to improve early childhood education, and to create a community for this new and growing profession. Olivia and Carter delivered a message of hope by showing participants the power and drive of today’s youth towards wanting to make a difference and to be part of the solution. They encouraged everyone to continue to create opportunities that will inspire and engage youth in environmental and animal conservation. 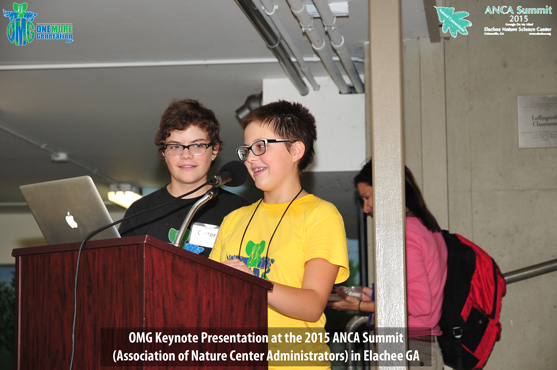 After their keynote speech, they conducted a roundtable discussion with participants where they explored ways to offer more opportunities for younger visitors to actually become members in their local nature center community. I am sorry to be so late in responding to your message. The conference concluded Saturday night but two Sunday field trips kept some of us working until yesterday evening. Carter and Olivia’s presentation was one of the best moments in a conference filled with highlights. Their speech and its very important message was delivered with confidence, insight and humor-laced style that went well beyond their years. It was a powerful reminder to an audience of experienced environmental educators and administrators of why they entered the profession. From my vantage point behind Carter and Olivia, I had a very good view of both sides of the Wonder Wall Café’. Every face was rapt with enthusiastic attention and appreciation of the work of the One More Generation foundation. Thanks for attending the conference. We hope that Carter, Olivia and their terrific father enjoyed their visit as much as we did. Let’s all stay in touch. If you have an event that would benefit from Olivia and Carter’s participation, please let us know and we will gladly see about fitting that in our travel schedule. You can see all the pictures we took from the event on our FaceBook page and please make sure you “Like” our page while you are there. Thanks again for learning more about this event and we look forward to your feedback.